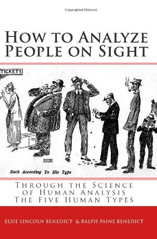 An amusing and fascinating description of the human race, this book delves into the systematic analysis of people and their primary characteristics. It is based on the concept that there are five main personality types. Every type can be identified on sight, and recognition of personalities is centered solely around physical appearance. This science of character recognition is explained in precise terms that are broad enough to relate to. Virtually anyone can connect with and believe in the theory. This description of human analysis focuses on the idea that every individual fits a certain mold. The elemental traits of each person can be recognized by his or her body shape and physical attributes. This publication details the importance of understanding oneself as well as the necessity of relating to others. It explains that instantly reading a person’s physical characteristics leads to awareness, which may promote healthier, more successful relationships.